During dinner, you don’t eat from plates put on the floor, because you feel it’s not hygienic. Then, why should your dog, your best friend, eat from plates on the floor? Isn’t that unjust and unfriendly? I guess if dogs could speak, they would have cried out against such blatant show of unfriendliness. But don’t feel guilty yet, you still have the chance to make it up to your 4-legged friend through an elevated dog bowl feeder. Elevated dog bowls give you the opportunity to make the feeding habit of your dog more comfortable, healthy and dignifying. With it, you can treat your dog like the family friend he is. So, we have put together a rundown on the top 10 best-elevated dog bowl feeders, and how to buy one for your dog. Just follow our tips to get the right choice. There is nothing much to look for in an elevated dog bowl because of the simple design that consists of only a small box and two bowls resting on top of it. Nevertheless, there are other functionalities and features you can consider when buying your dog bowl feeder. Adjustable height: Some models of elevated dog bowl feeders come with legs or height settings that you can adjust to match your dog feeding process. If you have a growing dog, this is what you should consider buying as you can adjust and readjust it to meet the height of your dog. This type is also good for groomers and vets. What about Storage Space? Do you know some models come with a storage platform where you can keep lots of dry dog food? Think about it, especially if your dog is a great eater or you lack a storage space where to keep your dog food, if so. This type is for you. Decor compliment: At times you may want to buy a product that will match your dining, kitchen or overall decor settings. If this is the case, try to locate the product that will blend easily with your indoor settings. Go through our review, and you will find sleek and beautiful design product that will suit your style and taste. 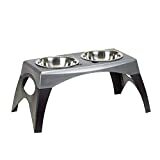 So, we start our review of the best-elevated dog bowls feeder with the Bergan Double Bowl Stainless Steel elevated dog feeder that combines form with function. 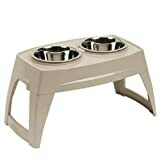 This elevated dog bowl feeder has removable legs that make it adjustable to provide ultimate comfort for you and your dog. Big aging dogs won’t have any problems bending down to feed on the stainless steel bowls, which can easily be removed and clean at any time. 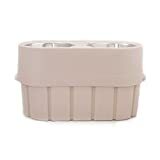 To add functionality and good look to your home, buy this unique design pet feeder stand with thick stoneware bowls that are resistant to water and easy to clean. The BestVida elevated dog feeder showcase a natural design of wrought iron with antique copper coating design. The feeder stand comes in two size-heights—5 inches and 9 inches tall—perfect for medium and large dogs. Suncast is designed to help you keep the serene and beautiful environment you have around you, by providing you a feeding tray with adjustable leg options. The two stainless wide bowls sit perfectly atop the tray, which in turn rest on perfectly secure legs under. This is a top option for your big or small dog. If your aim is to promote a healthy and happy life for your pet, the Pet Fusion premium feeder is your best bet. This dog feeder bowl comes in different sizes and heights. It’s more than just a feeder, featuring rubber inserts and anti-slip feet that prevent bowls from spinning, together with water resistance multiple coats. Your dog would surely love this feeder. Take some stress off your medium size dog by this wonderfully elevated bowl feeder. The design of its feature can fit into any form of decor, either in the kitchen or around the dining room. It has a perfect spill ridge that prevents food and water from messing up your floor, even as the two stainless bowl of this USA-made dog bowl feeder is thick enough to hold food and water correctly. As the name implies, “Our Pets” actually cares for your Dog. The N-Feed Adjustable Feeder is not just a raised dog bowl but also comes with a storage compartment that can store about 15 pounds of dry dog food. Well balanced with adjustable height features that can rotate 180 degrees for proper height feeding. The N-Feed also features an innovative self-watering system that keeps water fresh. With this product, spill food and water are totally vanquished from your dog feeding area. Let Bingo, Maxwell, or Rambo know that he is loved by providing him with this Premium Elevated Dog Feeder that will ensure he doesn’t have to stoop to eat. This bowl feeder will save your dog indigestion and back pains caused by stooping when eating. 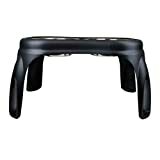 The design is sturdy and has no detachable parts so that it will fit perfectly into your decor. It is durable for being water resistant, and it comes with two extra bowls which you can rotate with the current ones. The best part of it all is that, if you aren’t satisfied with the performance, you can return it. IRIS Airtight Elevated Dog Storage Feeder is one of the greatest feeder bowls ever! The IRIS comes both as an elevated feeding bowl stand and storage platform that can store up to 64 cups of dog food. The storage compartment sealing is air-tight as such that your food can remain dry and fresh inside. 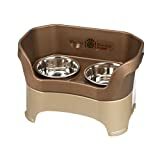 It comes with two stainless steel bowls from which your dog can eat and drink at the same time. The IRIS is just too perfect! Let’s face it! This is a spectacular product, in particular with the tall version (8 inches) suitable for dogs. The anodized aluminum (including stainless steel bowls) means the feeder will be less corrosive and stays longer than most others without this feature. This pet feeder also comes with anti-slip feet and bowl inserts to make sure everything is tidy and secure. And in the event of any damage during shipping from the manufacturer, a 12 months warranty is available for money back or replacement. What else would your dog ask for? We can only say WOW about this dog and cat bowl feeder—the best of its kind in the market! The Neater is the first dog elevated feeding system in the world that contains splashes and spill reservoirs while separating spilled food from spilled water. 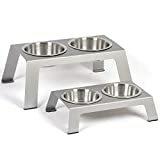 Designed for dogs weighing 30-100 pounds, the Neater has an excellent height standard, with two large stainless bowls—each differing in size—for food and water. The legs are adjustable, and the feeder is compactable with slow feed bowl. At last, we are here, and we believe you have gone through our review of the top 10 best-elevated dog bowl in 2019. By now, you already know how natural, rational and lovely it is to keep your dog in good health by changing his feeding pattern. So, have you made that choice yet? Which of these elevated feeding bowls would you love to choose from our review above? Don’t reluctant to pick up one for your pet. We look forward to your invaluable contribution.